Press L1 while attacking, rolling, or quickstepping to transform the right-hand weapon while attacking. With a firearm equipped, a shot fired by pressing L2 with proper timing just before an enemy attacks causes the enemy to stagger. An enemy can also be caused to stagger by facing its back and holding R2 to unleash a charge attack. 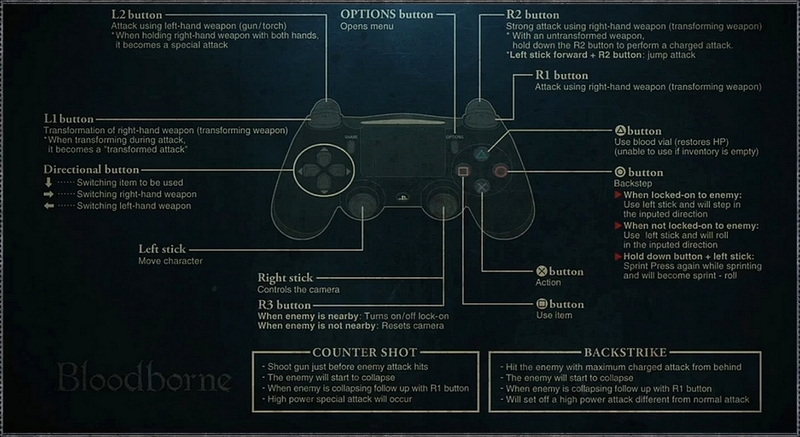 Once an enemy staggers, press R1 to execute a visceral attack. When an enemy's attack hits, a portion of the HP gauge briefly turns orange, indicating the amount of damage inflicted. Attack the enemy before the orange bar disappears to restore a given amount of HP. Blood Bullets are crafted with your own blood and can replace Quicksilver Bullets for use in firearms. Press UP to restock a Blood Bullet at the cost of HP. Blood Bullets are lost upon death or upon entering the Hunter's Dream. Click the left side of the touch pad to open the Gesture Menu, refer to the icons on the Gesture Menu, and move the controller accordingly while holding X.